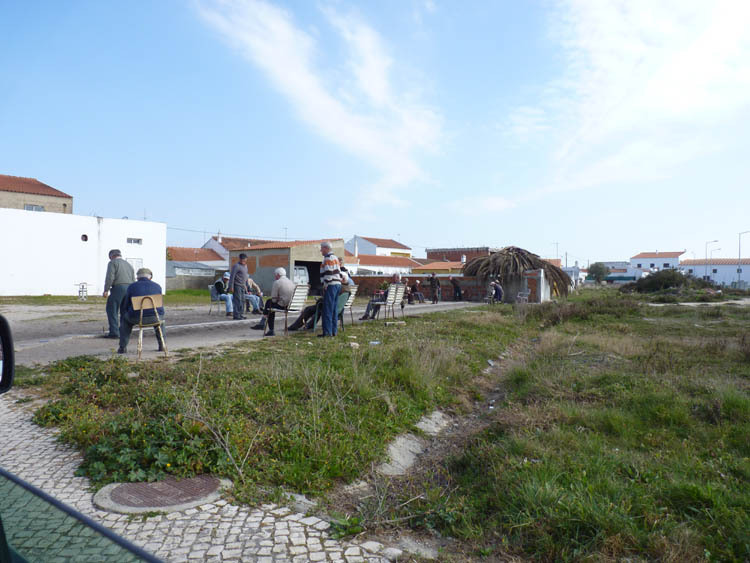 A few weeks ago we returned to Praia do Vale dos Homens to show friends the pair of white storks we’d discovered nesting on an outcrop of rocks. As we drove through the back streets of the sleepy village of Rogil we noticed a group of elderly men gathered on some waste ground. Some were pacing up and down, and then bending down as if to examine something, while others sat on an assortment of old chairs and upturned boxes watching intently. Curiosity got the better of us so we stopped the car to observe proceedings from a discreet distance. As you can see from the photograph the men are congregating round an arrow-straight concrete strip about 20 meters long. 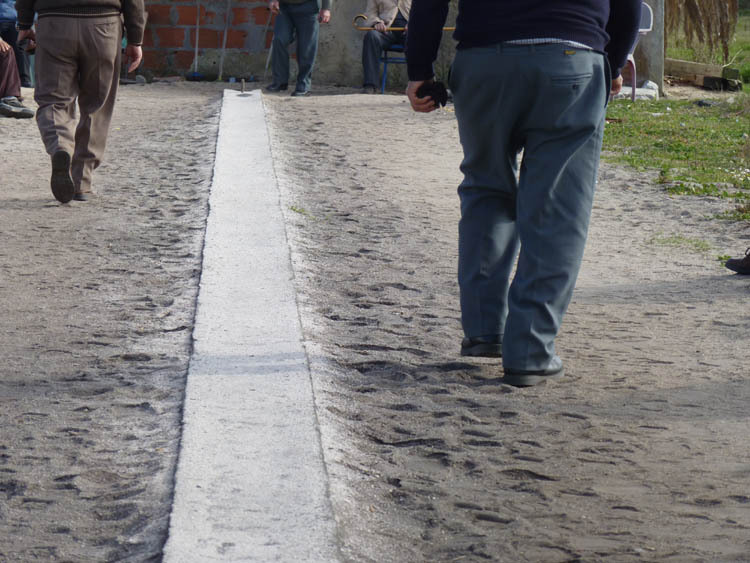 The men are congregating round an arrow-straight concrete strip about 20 meters long. Some of the men were holding two square metal discs with rounded corners which they then slid/threw with more force than precision (to my untrained eye) along the strip of concrete to dislodge a wooden pin situated at the far end. I was fascinated, and even, almost, but not quite, plucked up courage to ask one of the spectators the name of the game they were watching. This is where I become so cross and frustrated with myself becuase I lack courage confidence in using my limited Portuguese. So I sat in the car taking photographs instead. Even my friend felt frustrated by my lack of courage, took my camera and positioned herself to take a unobscructed photograph of the concrete strip. The moment I returned home I plagued Mr Google for answers. Nothing! Well what did I expect using such a vague search term as “Portuguese men playing a game with metal discs”. I then emailed a couple of Portuguese subscribers who comment on my blog. Result – they thought the name of the game was Jogo da Malha. Jogo da Malha, or Jogo de Chinquilho as it is called in some areas of Portugal, is a traditional Portuguese game reported to date back to the 15th Century. 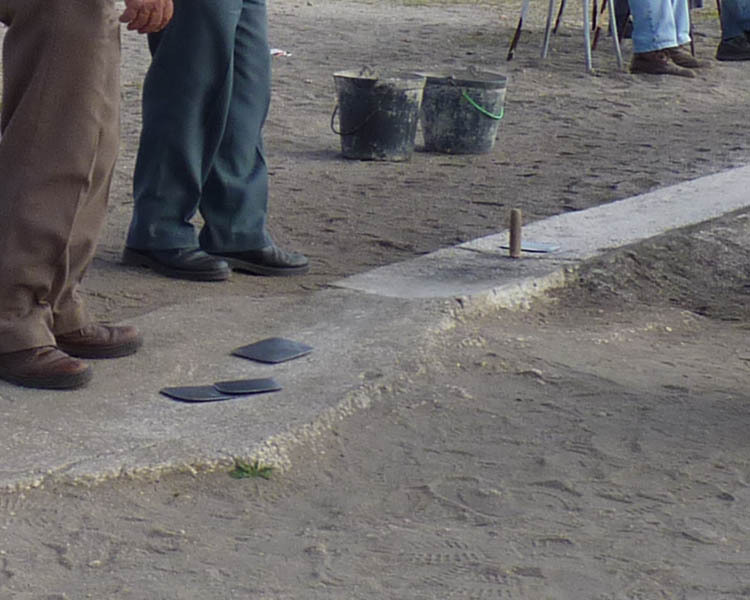 The game is played on a hard surface, and as you can see from the photographs of the game we observed, there is a long concrete strip sprinkled with what looks like sand or fine grit. A wooden pin called a meco is set up at the far end of the track and the players slide/throw a metal disc (mesh) to knock down the pino (meco). Please note the game does vary in that I have noticed in most photographs on other websites there is not a concrete strip, just hard ground. The discs may also be thrown and in some cases even stones are used. more near to this that the of the adversary, will earn 6 points. The stick after knocked down is put once again in the same small farm where was, small farm that that previously should be designated. However, I eventually struck lucky and found a website advertising a Jogo da Malha tournament. Unfortunately since I last visited the site a few weeks ago, my anti-virus software is now alerting me the site poses a security threat and is unsafe. There appears to be so many variations to the rules across the country that I’ve taken an overview from a Portuguese organisation who have organised a Jogo de Malha tournament. * Each team consists of two players and each game consists of two teams. The players have two meshes each. * Each player has two meshes which they throw alternately to topple the meco and leave as close as possible. * The first team to achieve 30 points wins the game. * Each match consists of a maximum of five games. Whoever plays 1st has 2 disc’s & they throw to knock over pin. Rules seem rather complicated ? If anyone has any further information about this game I would love to know more. Piglet, Himself is studying advanced Portugese… could you please email me the Portuguese text?… and I’ll ask him to have a bash at a translation of a missing bits for you. It’s like a cross between Curling, Bowls and Boules don’t you think? very interesting, i used to play bowls so its something along that lines. Very interesting. I don’t recall my relatives playing anything like this. But it does sound like a good way to pass the time outside, provided you live in a sunny climate like Portugal. It was a beautiful sunny afternoon. I would love to have a go, but seems it was not a game played by women. Well at least there were none there. So it’s a version of “Jogo da Malha”. I actually played a northern Portugal version once on a picnic a very long time ago. I remember it was fun but I can’t remember the rules at all. There certainly seems to be many “versions” Actually thinking about this again it’s almost like beach bowls or petang? Horseshoes is another very old game. I wonder how that game was created and by whom? I had never seen this being played although I know the name. I love that google translation. the google translation re Sweaters and farms made me laugh. I wondered if the words Mesh and Meco were real words? Sounds a bit like Bocce Ball . . . or Horseshoes . . . or Shuffleboard . . . or Bowling . . . or Curling. My wife was born in Sao Joao Da Madeira. She tells me the men used to play this there as well, though she remembers that the mesh was round and was called something else, uma malha, and was round. She also said the’ pino’ was just banged in a bare stretch of dirt.